AARP is betting that a new generation of seniors mean more spending by marketers. Scott Tong of MarketPlace Business talked to Lori about the risks and rewards of marketing to older consumers. Is grandparenting the ultimate “do-over”? 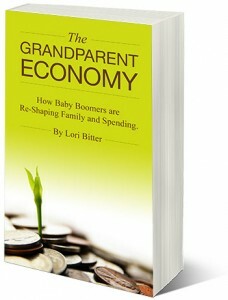 Lori talked to Huffington Post, on behalf of GRAND Magazine, on the evolution from parenting to grandparenting. Can bad parents make good grandparents? Is there a healing power in these multigenerational relationships. Read more here. For the Year of the Boomer — 2014 is the year the youngest Boomers turn 50 — here is another installment in my survey of 50 Boomers across 10 career categories who have reinvented themselves within the last 10 years. Filed Under: Advertising, Aging, Baby Boomers, Business, Business of Aging, Company News, Featured, HP-News, Interview, Lori Bitter, Lori In The Media, Uncategorized, Women | Tagged With: Advertising, Baby Boomers Midlife Reinvention, BOOM, Getting Fired, Jwt, Midlife Branding, Personal Branding, Reinvention, YOU'RE 50! Lori Bitter comments on LinkedIn and the value of the social site to older employees. For this week’s show we speak with Kathy Dragon, CEO of TravelDragon.com, owner of The Dragon’s Path, & VP of Dragon Consulting Inc. Kathy has spent the past two decades in the center of the active, adventure and sustainable travel industry. As a tour operator and guide she has personally escorted over 3000 guests on small group tours around the globe and created programs in conjunction with local guides and properties. Kathy is a frequent international speaker and consultant in the travel industry specifically focusing on authentic/responsible travel and the influence of the Boomer & Beyond market…those who expect and are willing to invest in this new type of travel. A contributing author of BOOM: Marketing to the Ultimate Power Consumer—The Baby Boomer Woman, Kathy is a frequent speaker and creator of content for industry blogs, newsletters, podcasts and articles. For this week’s show, The Business of… Brain Fitness, we have guest Henry Mahncke, CEO of Posit Science, the leader in clinically proven brain fitness software. Their software is scientific brain training designed to improve memory and cognitive skills. For this week’s show, The Business of… Assistive Listening Devices for Older Consumers, we have guest Michele Ahlman, President of ClearSounds Communications, a Chicago-based privately held company that provides high-quality sound enhancing products for the boomer, senior and caregivers market. As a leading provider of niche telephone and communication products, ClearSounds is the leading manufacturer and distributor of ClearSounds branded products including amplified phones, signaling devices, TV listening systems, clocks, audio accessories and cellular products.